Dalton has specialized in the development, manufacture and sterile fill/finish of pharmaceutical and biotechnology products for over 15 years. We offer aseptic filling and terminally sterilized products in a variety of finished dosage forms. 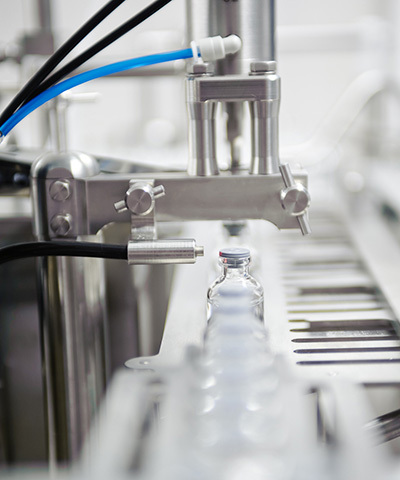 Aseptic filling of sterile drugs, also known as sterile filling/finish, remains one of the most critical processes in biopharmaceutical manufacturing. Dalton can support your cGMP sterile manufacturing and filling needs for clinical development through to small scale commercial batches. We develop and manufacture cGMP sterile products fast while meeting current regulatory quality standards. Our flexible approach and integrated offering means we make complex steriles simple. With our Steriles made Simple℠ program we can manufacture your sterile liquid in a vial for Phase I/II clinical supplies in about 4 months. We offer a selection of in-stock vial container closure options and commonly used excipients to deliver clinical materials faster, compliantly. Call us today to find out more about our expanded lyophilization capacity. Learn more about our cGMP sterile manufacturing and fill/finish capabilities. Dalton can utilize your API, or we can make API for you, even if you require Sterile API Manufacturing. Our formulation experts then work with you to create the right aseptic or sterile vial dosage form, by optimizing your formulation or our Master formulators can develop a formulation for your product using DoE. We manufacture your products in our newly expanded and upgraded sterile suites which now include upgraded HEPA systems, RABS aseptic filling line enclosures, vial washing and depyrogenation as well as a new in-house WFI system which meets global sterile manufacturing standards. Our cGMP approved aseptic filling suites offer a static and operational Grade A (ISO Class 5) environment. All areas of our aseptic processing facility, including ancillary support areas, are routinely monitored for viable airborne contamination, viable contamination on surfaces and non-viable airborne contamination by our on-site QC Microbiology Laboratory. The area is fully supported by our in-house Analytical Chemistry Laboratory and Quality Assurance Departments. Dalton provides reliable, safe and efficient cGMP Sterile filling services from preclinical to small scale commercial batches. Our goal is to accelerate your sterile injectable products to market safely and efficiently through our integrated drug development and manufacturing process.